Loanee striker Radamel Falcao "wants to stay" at Manchester United but says his long-term future depends partly on how often he plays for the club. The Colombia striker, 28, has scored one goal in eight appearances since signing for the season from Monaco. Earlier this month United boss Louis van Gaal said Falcao was only fit enough to play for 20 minutes, but Falcao says he is now "almost 100%". "I am very happy in this city, in this club. I really want to stay," he said. United have an option to sign Falcao, who is earning approximately £265,000-a-week in Manchester, for £43.5m at the end of the season. But the striker, who missed the World Cup due to knee ligament damage, has had limited impact during his £6m loan deal so far, due partly to injury. Falcao said: "I'd like to carry on [here] but I have to analyse the situation, see if I play more and see what decision the board takes. "Every footballer wants to play, no one is happy when they are not playing. I feel ready for the moment that the team needs me. "I am not playing many minutes at the moment but I am sure there will be more opportunities to play." 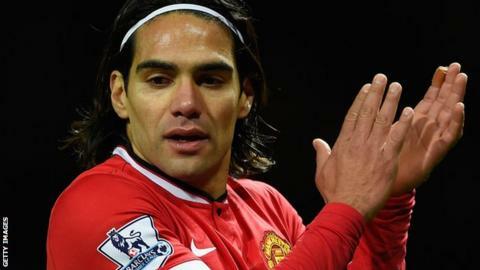 Falcao, who joined Monaco for £50m in May 2013 from Atletico Madrid, has not started a game since he scored his only United goal against Everton on 5 October. A calf injury ruled the player out for a month but since he returned he has made three brief appearances off the bench, the latest one being a 12-minute cameo in the 3-0 win over Liverpool which kept United third in the Premier League table. How will Falcao fit in at Man Utd? Read more on Manchester United: How will Falcao fit in at Man Utd?